A VERY HAPPY CHRISTMAS and a PEACEFUL NEW YEAR. 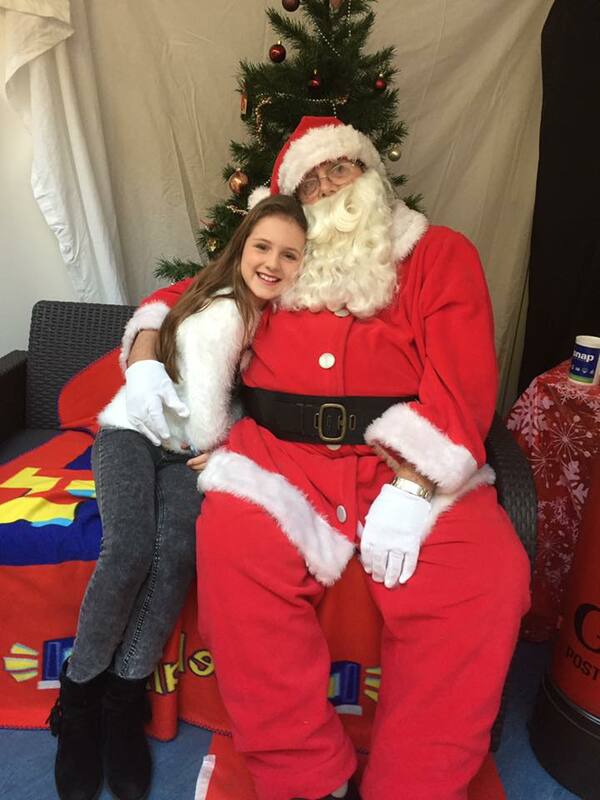 PS in case you hadn't already guessed that is my own Santa with his youngest granddaughter on one of his several outings this Christmas. The chickens are getting used to their prisons, but continue to try to push past me when I go into feed them! I am certainly using more food as they cannot find find the extras that free-ranging allows. I am spinning out the apples, marrows etc and David has the workshop oven lit each day to cook up vegetable peelings, which he is mixing with the gash flour from the mill. I have written before about my annual quest to find a present for a friend who has all he needs (and more) He always buys me books from a charity shop and I always make him something. For example, knitted dishcloth, dusters from old shirts and home made polish from out beeswax, an apron with a picture of his current house on the pocket, a tea cosy embroidered with a pic of his old house. You get the idea. This year |I have made him a dundee cake which I am putting in a tin on which I have stuck a label that resembles a bookplate. He is a serious collector of bookplates, owning thousands and adding to his collection all the time. Bookplates always have an illustration of some sort, the book owners name and often the words "Ex Livre" - meaning "from my library". My latin is non-existent and I have been trying to find the latin for Kitchen, but have had to settle for "oven". I know he will get the joke. I am also making him some stuffed dates, which I will make nearer the day, though I did make some almond paste yesterday for one of the fillings. I am not in the least bit worried that he will read this before the day as he can't even use a mobile phone! Put everything together in a pan and cook slowly until thickens ( so a view of the bottom of the pan can be seen when a wooden spoon is drawn over it) This took over an hour. Put into sterilised jarts and seal. Has anyone else had a surge of Russian readers again? At least somebody loves me - I seem to be losing followers on Google again (while the Bloglovin numbers grow steadily) Is it something I said? Still unseasonably warm here. Off to post local Christmas cards and letters from the Civic Society and won't need hat and gloves methinks. Quick one here. I know I have been away from posting for a while though I have been reading other blogs. Still incredibly busy here, though it should slack off a bit soon now that the Civic Society's public consultation is over, with the assessment of results nearly complete. The big news today is BIRD FLU! It is the first time that we have been asked to keep our free-range birds in for 30days because of bird flu on the continent. This request (on the news) was really quite robust when in the past it has been more of a suggestion. So today before I let the girls out of their 3 sleeping/laying/fox proof homes, I gathered various pallets, string etc so that I could secure them away from wild birds. As someone who prides herself on the freedom my girls have, I am saddened that they will not have their lovely lives for a month. Not as upset as the girls you understand, as they are seriously p****d off! The 6 almost-pullets in the goose house are now restricted to that house and the small run attached. The goathouse crew (new cockerel, a couple of broodys and grown chicks) are now shut in the goathouse. Later today I shall combine these two groups into the goathouse as they will have more space there. The main flock are excluded from the orchard and are in the first run before the orchard where we usually feed them. This run is netted above so should exclude all but the smallest birds, who access this run from all sorts of entry points! Here are some of the orchard hens. This enclosed area is four times the bit you can see here, The little old house you can see is left there as a place to shelter, with some nice dry soil underneath for bathing. Behind me is a hen house that opens onto this run too, at the moment no one is using it, though it is available if they want it. Further through the run is the entrance to the main chicken house and through the fencing is the orchard. Here is a pic of the hens in the orchard (on the other side of the part of the fence you can see above) a while ago, they are crossing the pond that will certainly miss now that they are "locked in"
And here is the empty orchard this morning! A rather sad sight. I guess I will be using some of the stores I put by ( to keep them interested in the winter) sooner than I expected. All for now, hoping to blog again soon.